Shop at the Gap for free… by paying my cable bill!?! This guest post is written by my charming boyfriend George. He was able to get free rewards gift certificates to Gap brands in excess of $1,000! Read on to learn how. Earn 5 points per dollar spent at any “Gap Family” (Old Navy, Gap, Banana Republic, Piperlime, and Athleta) store. Earn 1 point per dollar spent anywhere else. For every 1,000 points you accrue, you will receive a $10 gift certificate good to any Gap Family store. 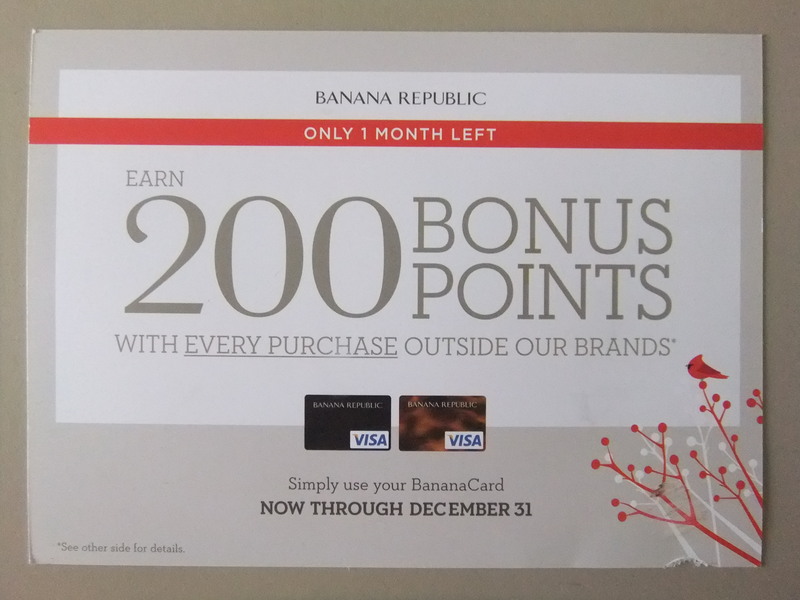 The postcard states that I would receive 200 points for every purchase that I made on the card until December 31st. I skimmed the fine print on the postcard, and there was no minimum dollar amount for each purchase, and there was no maximum to the number of points I could earn. This meant that every purchase made on the card would earn me $2 worth of gift certificates. Fast forward a few days, to when I was paying my cable bill online. I remembered the Banana Republic promotion, and I found that the system allowed me to pay my cable bill $1 at a time. By paying my $36 cable bill one dollar at a time, I was able to make 36 separate transactions and net $72 worth of gift certificates! Interestingly, the cable company’s online system even allowed me to continue paying even after my December bill had been paid in full. These extra payments would go toward my January bill, then February, and so on. While making a single $1 payment did not consume a ton of time, it wasn’t entirely quick either. I’d estimate it took between 30 and 45 seconds. Fortunately, using my computer background, I was able to automate this and “record” myself making a single $1 payment, and subsequently “play back” that recording multiple times. This allowed my computer to continue making payments when I was washing dishes or reading. In all, I managed to make 526 different purchases on the Banana Republic card during this promotion, the bulk of which were $1 cable bill payments. As a result, I earned $1,052 in gift certificates to any Gap brand, and my cable bill is paid for the next 8 months. Check back tomorrow to see what we have purchased with these credit card rewards! 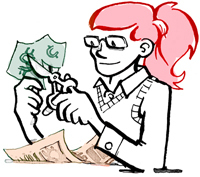 For the tech-minded folks out there, we used the Selenium IDE plugin for Firefox to do the bill-paying automation! Wow…. that is great! I so wish I could find a deal this great:) They always have things like this when I am freshly broke! LOL! I’m still a little behind from Christmas! Congrats on your find! Thank you & thanks for stopping by! I hate it too when there’s a great deal, but I really can’t spend ANY extra money.